…This is the design I settle for when claiming for Aotearoatanga, New Zealand unity. (It could also double as a republican flag, thus, I also propose related designs derived from this in order to have a complete set of concept art flags for that possibility). Because it is an Aotearoatanga flag, it can be waved without necessarily implying a republican sentiment. For example, it can be flown as to defend an Aotearoatanga feeling against the inherently separatist movement of Māoritanga or a potential backlash into "Pakehatanga". 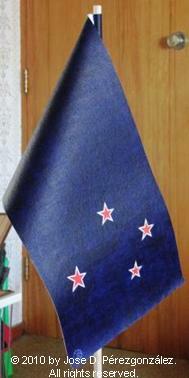 …The flag is based on the national flag of New Zealand, excluding the Union flag from its canton. However, its background is not Pantone blue but violet, representing the unity of Māori and Pakeha in a single nation and culture. The violet background thus represents the mix of red and blue: red for Māori people but also for the blood shed by New Zealanders' in the defense of the country; blue for Pakeha people but also for peace, unity and prosperity brought by them. The Southern Cross represents the location of New Zealand in the Southern Hemisphere, while its red stars further emphasizes the Māori culture as being the soul of New Zealand's culture nowadays. …Although the design of the flag is simple (some may even say too simple), the flag would be unmistakable in two accounts: it is the only flag using violet as background colour, and the Southern Cross is represented as four red stars outlined by white, placed on the fly (as today's Southern Cross representation in the national flag of New Zealand). …This design is peaceful in meaning, and, thus, the background violet is a purple biased towards blue, rather than a middle purple. (The screen colours you may see above are approximations only).